Different Types Of Coffee – Coffee is a popular beverage which consumed by people around the world. This beverage mostly consumed everyday as dessert to breakfast, lunch, or dinner. Coffee beans is rich of chemical properties such as caffeine, acid, and antioxidant. And based on the studies, coffee beans also have healthy benefits such as reduce the risk of depression, make happier, burning fat, reduce the risk of type 2 diabetes, to protect the liver ad heart disease, reduce the risk of some types of cancer, and others. 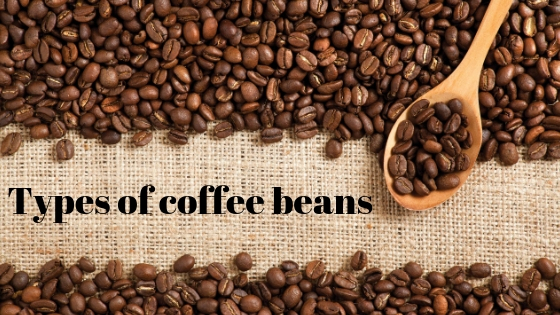 There are four different types of coffee beans which each type has varying component such aroma, flavor, size, shape, and other natural properties. So, just stay on this article and get more information all about coffee bellow! Arabica claimed as the highest quality of coffee beans which a high consumed up to 60% in the world. This type has pleasant flavor and lower acidity than other types. Arabica plant is grown at the high altitude where have amount of shade and over rainfall. Growing this plant is more costly than others coffee plant because it’s intolerance to crops disease. Arabica is grown in relatively the cold climates areas between the cancer tropic and Capricorn such as African and Asians, but currently cultivated in America, and Europe. The attributes should be in the Arabica’s superior quality are lower acidity, grade A in size, stronger pleasant aroma and flavor. This type is second grade to Arabica, but has higher main properties, caffeine. Robusta ideally grown in the hot climates and low altitude where heavier rainfall. It’s more resistance to crop disease than Arabica because it has more caffeine contents. Robusta is easier to be grown and lower cost than Arabica. That’s why this coffee beans price is cheaper . The attributes of its superior quality are lower acidity, rich of flavor profile, bigger size (grade A), and smooth in texture. After decimated in 1890s, liberica come to consumed again in 1995. Even though this type closed to Arabica, but both of mostly different. Liberica has a unique irregular shape and bigger size than other coffee beans. This coffee bean has pleasant aroma and flavor which closed to similar with Arabica, event it’s not completely the same. This type widely grown in Southeast Asia which contributed more than 7% of coffee beans products in the world. Even Excels is claimed as liberica family because they grown at nearly the same altitudes and shape, but both of them are really different. This coffee bean has unique flavor and commonly consumed by mixed with others, in order to enhance its flavor. One of the factors that determine the taste quality of coffee is brewing methods. The brewing methods of coffee beans produce the different flavor, caffeine and acid content, antioxidant, and aroma. In this chance we would like to review about some brewing methods of coffee beans, so that please stay to read on this article. Coffee cone is the oldest drip method of brewing coffee. This drip method is known as the cheapest and simplest method by using coffee cone and paper filter to separate the remains coffee and its extract. Ground coffee placed on the paper filter and poured by hot water, then let it dripping down to the cup. its flavor quality is depending on the cone shape and the filter used. this method is also enable to control of the taste, water temperature, and its strength. Chemex is a unique pour over which was created by Dr. Peter Schlumbohm in 1941. Chemex paper filter is designed about 20-30% heavier than other filters. It capable to separate unwanted component of coffee such as sediment, oil, and fatty acid. Chemex is created from glasses which better and safety for hot beverage than plastic. The Ground coffee placed on the paper filter and poured by hot water, then let it dripping down into the double flasks. The French Press is the simplest brewing method of coffee beans. The ground coffee is extracted by soaked to boiled water, then pressed it out. French Press is also claimed as cleanest brewing method because it does not use any paper filter which containing of chemical component. This method can keep mainly properties of coffee beans such as caffeine, essential oil, and antioxidant content as well. One of the important antioxidant that found in coffee beans is chlorogenic acid. This antioxidant acts to againts some human disease such as alzeimer’s, parkinson’s, and dementia. The yield has stronger flavor, than other brewing method. Aeropress is one of brewing coffee method by using gravity to catch and to keep the flavor of coffee beans. It created by Alan Adler in 2005. It is made by plastic and the filter placed at the bottom of the brew chamber. Ground coffee is steeped by hot water in the brew chamber, then its plunger is pressed down to create air pressure to filter out into a cup. the benefits of this brewing coffee methods are the yield has less acidity, the process is very fast that takes only 30 seconds, lower caffeine, cheap and easy to get and to bring anywhere. This method is suite to traveler because it’s made by alluminium, so it’s easy to bring anywhere. The process of stovetop moka pot is fastest that only takes 5 minutes. In the basic principle of this machine is using steam pressure that caused by boiling water in the bottom of camber. This brew coffee method is created by Alfonso Bialetti, and had been patented in 1993. stovetop moka pot does not require an electricity, cheap, and its yield is strong coffee flavor. The siphon is a unique and cute coffee brewer. This machine was created on 1840s in Germany. The groung coffee is steeped with hot water in the top vessel. When its heat water removes, the gravity pushes back to filter the coffee into the bottom vessel or cup. Based on its name, cold brew method is a process of extacting the ground coffee in cold brewing. Ground coffee is steeped in the cold water for 18 to 24 hours in fridge. Many advantages of cold brew method such the yield has lower acidity than hot brew method, so it suited to those who stomach sensitivities, rich of flavor properties, higher caffeine content than other hot brew coffee. Coffee drinks are mostly consist of espresso as a based ingredient. The different types of coffee drink are based on the way of they are made, the ratio of ingredient, and also their topping. 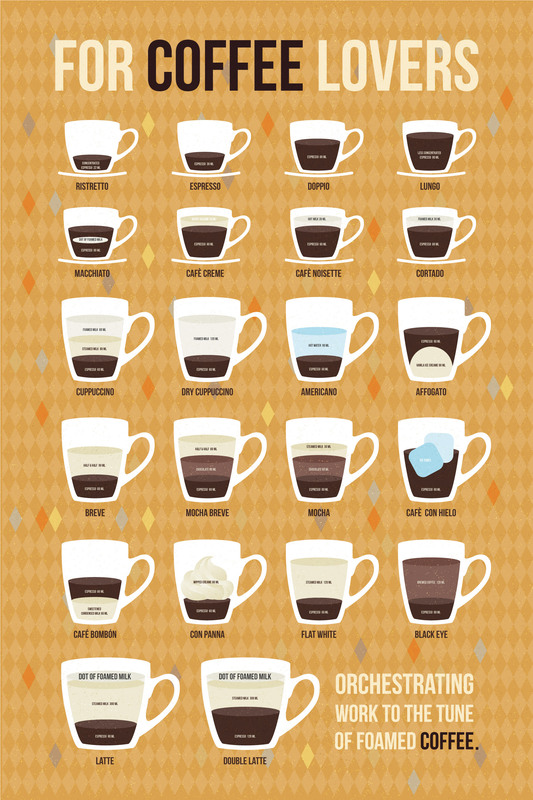 There are many types of coffee drinks which widely consumed people in the world. Some of favorite coffee drinks are mocha, cappuccino, and espresso. They not only have vary uniqueness of flavor, taste, aroma, but also its nutrient content. Espresso or short black is original coffee drink which no components added. This beverage taste is bitter which not people want to consume it. An espresso simply made by adding the boiling water to espresso machine and the pour into the small cup. Double espresso or doppio is beverage which containing of two short espresso in a cup. Its taste normally the same with short black, because it’s added nothing other component. Short macchiato is a short espresso which added by steamed milk and foam milk on the top. Despite it’s so simple to make, but nearly each country has the different way of making this coffee drink. Short macchiato is served in the smaller cup with three layers which the differ appearance.in the base layer is a short espresso that looks darker, in the middle is mixed of milk and espresso which looks more bright, and on the top is steamed milk that looks white. Long macchiato is beverage which is consist of two short espresso and topped with steamed milk and foam milk, served in a tumbler glass. Ristretto is a strong espresso which extracted by mixed of coffee and water with the same ratio. This coffee drink has stronger flavor, aroma, and caffeine content than commonly a short espresso. Based on history, long black Americano is adopted from American soldiers habit during the second world war. They used to make and consume this beverage as long. That’s why this long black (coffee) called as long black Americano. This coffee drink is made by adding hot water to the cup up to 2/3 of it and followed by steamed milk and foam. Café latte is one of favorite coffee drink which contain of three layers are black coffee or a short espresso, steamed milk, and micro foam. The bottom layer is a short espresso and following by steamed milk and micro foam on the top up to 1 cm. Its taste sweeter than espresso due to its milk topping. This coffee drink is the most favorite of coffee drink which used to be consumed as breakfast, lunch, and something else. Containing three layers are a short espresso, steamed milk, and micro foam on the top up to 2-3 cm and sometimes topped by chocolate powder. Flat white is recently popular beverage in the world. This coffee drink made by a short espresso then following with steamed milk on the top, but no foam or chocolate powder added. Its taste milky, so that suited to consume when relaxing time. Flat white is mainly found in new Zealand, Australia. Piccolo latte can be made by a short espresso or a short ristretto in a espresso cup, which topped by steamed milk and micro foam. Its flavor is lower than pure espresso because of its topping. This coffee drink is mixed of cappuccino and chocolate liquid or powder, which adding steamed milk, micro foam up to 2-3 cm on the top and cohocolate sprinkle, but sometimes substituded by whipped cream as topping. Affogato is coffee drink which consist of single or double espresso with vary topping such as ice cream, crackers, dark chocolate, and other toppings. This coffee drink is used as dessert after having dinner and during summer. This coffee drink is approximately different to the others. Irish coffee’s brewed by adding whiskey ( a kind of alcohols), sugar, and cream as a topping. It is only found at café or restaurants in new Zealand because of its alcohol substance. This beverage has stronger coffee flavor and creamy smooth taste. It’s consist of two strong espresso then topped by mixed sugar, steamed milk, and also sometimes substituted by whipped cream.